Naser Muhyealdeen, B.A., B.S., J.D. Qualified Member of the Government of Dubai Legal Affairs Dept., Member of the UAE Rulers Court as an Advocate and Legal Counsel, Member of International Law Bar Association, Qualified Litigator & Member of DIFC Courts, Associate Member of Dubai International Arbitration Centre, Member of the Abu Dhabi International Arbitration Centre, Member of London Courts of International Arbitration (LCIA). Mr. Naser Muhyealdeen holds Bachelor of Arts (Political Science & Economics), Bachelor of Science in Law, Juris Doctors in Law, is a Multi-lingual International Lawyer who provides outstanding legal services in the region. For more than seventeen (17) years in the legal profession, he has litigated more than hundred (100) International Arbitration Cases against well-renowned developers and business entities in the GCC region- he has an outstanding client satisfaction rating of 95%. He has also supervised and attended over 500 mediation cases in the Dubai Courts Mediation Centre. 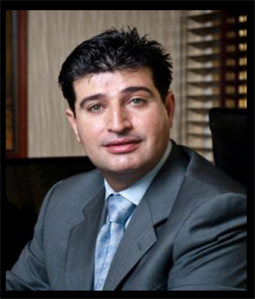 Registered as a qualified litigator in DIFC courts, he is also the legal representative of high net worth individuals, businessmen from the Kingdom of Saudi Arabia, GCC, Europe and Asia. Currently, acting as a private counsel to royal families and private investors from Kingdom of Saudi Arabia and Kingdom of Bahrain. Mr. Naser is the consortium leader for the Mavashier Real estate development project in Izmir, valued at over 150 million dollars. The consortium included investors from Europe, KSA and from the UAE. Represented Al Sharif Mousa Aljidi and brothers in the land dispute with partners in Saudi Arabia, where the dispute was valued 850 million Saudi Riyals. He has also worked in the following institutions: Associate and Legal Consultant in various law firms in London; Chief Legal Officer of Saudi Arabian Investment in London; Legal Advisor with the illustrious and prominent personality throughout the Arab region; Chief Executive Officer (CEO) and Managing Partner of Emirates Fortune Group; Legal and Investment Advisor to high network individuals for major Saudi businessmen; Advisor to the Iraqi Businessmen Council (Dubai); Advisor to the Turkish Businessmen Council (Dubai); and has concluded and supervised two major developmment transactions valued at 100,000,000 US dollars with the Turkish Prime Minister Investment Support Agency and Saudi partnership, has created joint ventures in major construction and real estate development projects worth over 300 million USD, assisted major developers in contract drafting with major contractors in Turkey and GCC region, currently representing large companies from the GCC, Middle East, Asia & Europe. Mr. Naser has recently created several joint ventures for large companies such as Lotus Technologies from China and GMCS from Switzerland with Saudi Arabian, Emirati and bahraini partnership to finance, develop, Renewable & Solar energy projects in the Middle East and GCC region. These joint ventures are expected to create over 500,000,000 US dollars of projects to be financed in the region where the finance is expected to be funded by Lotus Technology of China and its subsidiaries. Mr.Naser has also recently signed an MOU with the Armed Forces of the UAE represented by Major General Mr.Ishaq Saleh Mohamed Albaloushi, the MOU was signed by Mr. Naser Muhyealdeen and Major General of the armed forces to represent members of the armed forces in legal matters, either in the UAE or in the international law disputes. The law offices has also signed letters of intent with Major General Abbas Kamel director general of the president of Egypt to bring Lotus technology and other major construction companies to develop infrastructure projects and promote business in Egypt. Projects related to renewable energy, solar and green energy through Lotus technology and GMCS. International Law Seminar Washington, D.C., 2001.